You have stumbled upon a guide to the greatest outdoor gentlemans drinking game to ever grace the earth. There's no better way to create memories or just pass the time than by rounding up some buddies and playing a few rounds of Snappa! Originating on the beaches of Southern California, this incredible sport will challenge your endurance, agility, and dexterity. Grab three friends and a few packs of beer and let the fun begin. A Delicious Beer of your choice! Place one cup at each corner of the table, about index finger length from the edges. Arrange two chairs on either side of the table, behind the cups. One cup is designated to each player. This game is best played outside, in the true spirit of Snappa's beach origins. If playing outside is not an option, however, it can be played in a spacious room with reasonably high ceilings. Snappa gameplay is relatively simple and easy to pick up. I believe the best way to learn snappa is first-hand, but if your friends have never played then it's good to have a list of rules for reference. Each player takes turn throwing the die. Before every turn, the throwing player must call out 'Snappa!' to alert the opposing team that the game is live. A good snappa throw is made underhand, and your palms may face upward or downward. Whatever you are most comfortable with. The die must go at least as high as the tallest person sitting on the table. If a player doesn't throw it high enough, the other team may call 'Low' resulting in a lost turn. 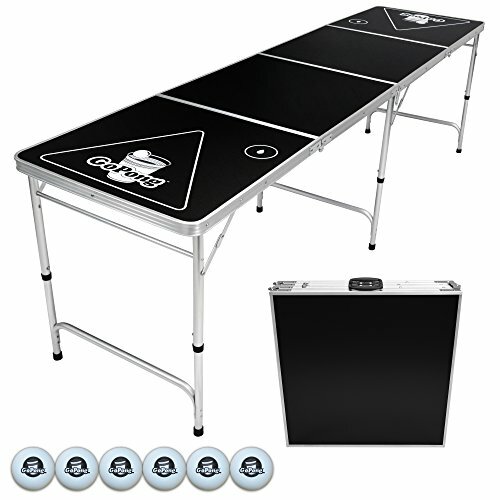 The object of your throw is to aim for the opponents edge of the table. This maximizes your chance to score. The first throw is determined by rolling the die across the table. A chosen player is required to call 'Highs' or 'Lows'. If the die is 1,2,or 3 it is low. Accordingly, if it lands 4,5,or 6 it is high. If the player is correct he goes first, if not the opposing team begins play. Player must alternate turns, and no team can throw twice in a row. That means after your throw, every other player should throw it once before you throw again. Making a legal throw that hits the table and rolls through your opponents goalposts(cups). This is 1 point. Making a legal throw that hits your opponents cup and rolls off of the table(a Clink). This is 1 point. Note that the die does not have to roll between the goalposts on a clink, it is a scoring play as long as it hits the glass and leaves the table. Making a legal throw that lands in one of your opponents cups(a Sink).This is the most coveted play in Snappa, and is worth 2 points. Keep in mind that on Clink and Sink plays, it does not matter if the die goes in/hits the cup directly or off of a ricochet, it is still a score. If the die hits the playing surface and does not go through the opponents cups or hit/go in a cup, then it is a non-scoring throw and your turn is over. It cannot be 'trapped'. this means trapped against your body with your hand, such as on your leg or chest. You may not get out of you seat to catch a die until it has made contact with a cup or table. This is why Sink's are the most revered play of Snappa. Not only are they worth 2 points, they are uncatchable as well. You'll notice somebody has sunk the player in the image above. This means he, as well as his lovely teammate, must finish their beverages entirely and then refill. An optional addition to the game is the Rule of Five, also known as "Biz". With this rule in effect, any time the dice come to a stop on the table with the number 5 straight up, all four player must drink. Additionally, after a Sink, the player must finish his beverage and then roll the dice out of his cup and onto the table. If it lands on 5, the player must drink another beverage and repeat the process until a 5 is not rolled. Remember guys, Snappa is a gentleman's game, so don't get into arguments or disputes over points. The true spirit of Snappa is enjoying time with your friends, whether it be on the beach or in the snow. If you have your own version of Snappa, or maybe have some suggestions for rule additions/improvements, let me know in the comment section. Snap-On!